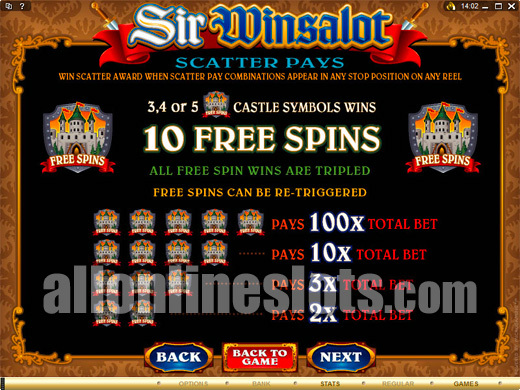 Sir Winsalot is a Microgaming 20 line slot with a kinghts theme. It has stacked wilds on all reels and two bonus features. The Beer Fest Bonus offers prizes as high as 6,000 coins and the free spins have a three times multiplier. 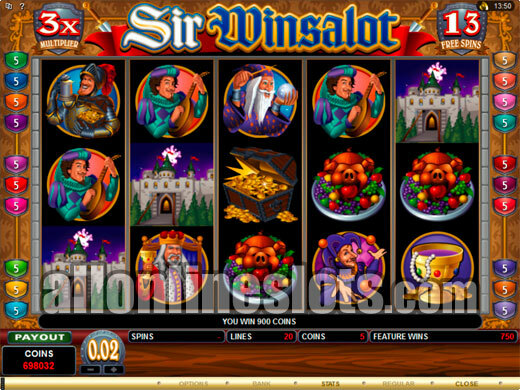 Sir Winsalot is a Microgaming powered video slot with 20 lines and 5 reels. It has a partying Knights theme with stacked wilds and two bonus features. Max bet is 5 coins per line or 100 coins total and coin sizes start at 1 cent and go up to a quarter. This makes the max bet range between $1 and $25. The game has several features which can lead to big wins. First up you have the line wins on the base game. As usual the wild symbols (Sir Winsalot logos) are the way to the biggest jackpots and Sir Winsalot up's the ante by having stacked wilds on every reel. This means you can in theory get a whole screen of wild symbols. Lining up just one line of wilds pays 1,000 coins multiplied by your line bet of up to 5. This might seem like a small jackpot but when you consider the the five wilds are easier to get because of the fact that they are stacked it starts to make sense. You also have to consider that if you get a whole screen of wilds you will win 20 times the top jackpot or 100,000 coins at maximum bet. Apart from the top jackpot of the five wilds there are quite a few good mid to low level pays including 750 coins for five Knights, 500 coins for five treasure chests and 350 coins for five kings. All of these are multiplied by your line bet so at max bet they pay 3,750, 2,500 and 1,750 respectively. The two bonus games both offer addition ways to win and both are activated by scatters. The pick a box style Beer Fest Bonus is won by getting three or more Party All Knight scatters while the free spin bonus is won by hitting three or more Free Spin Castle scatters. Getting five of either scatter symbol awards a nice pay of 100 times your total bet. The free spin bonus awards 10 free spins with all wins tripled. This boosts the top pay for a full screen of wilds to a huge 300,000 coins. The free spins can be re-triggered and the Beer Fest Bonus can also be won during the feature. 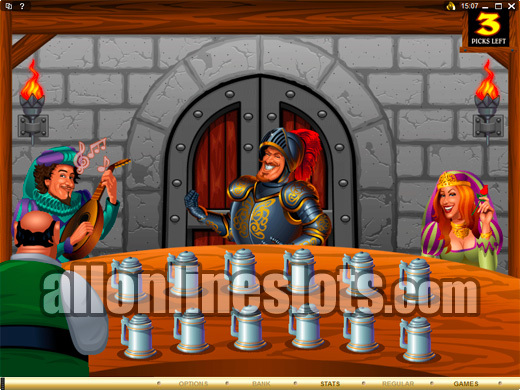 The Beer Fest Bonus is a pick a box style game where you get a second screen with the Knight sitting at a table full of beer jugs (View Sceenshot). You get to pick 3, 4 or 5 mugs depending on how many scatters you got to activate the bonus. Win up to 6,000 coins on this bonus game. We really like games with stacked wilds and it appears that a lot of slot players also like them. 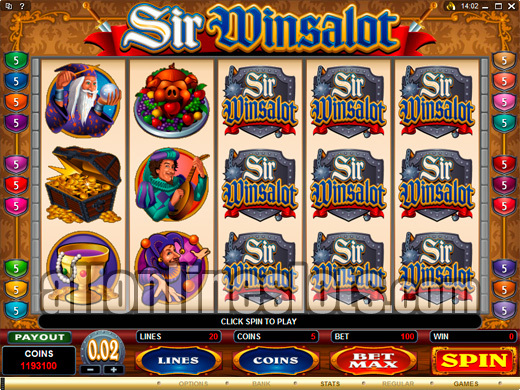 Sir Winsalot is a top notch game with big jackpots and enough mid to low level prizes to keep you going while you go for the features.